A 13,000-year-old mastodon skeleton was found during the construction of a 19th-century New York mill. 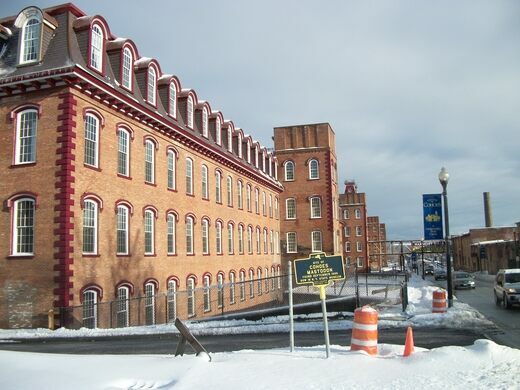 The historic industrial district in Cohoes, New York, contains a collection of red brick buildings with twin story towers, mansard roofs, and cast iron grillwork. 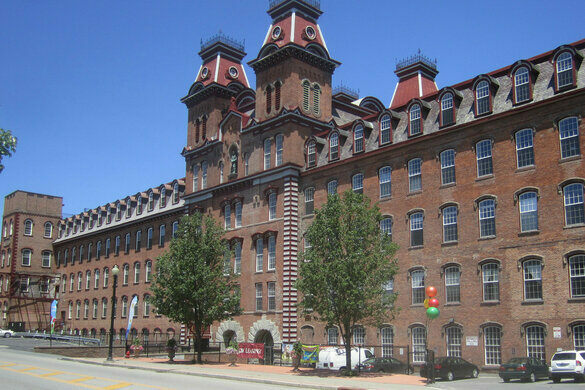 This mill complex, called the Harmony Mills, was also known as “Mastodon Mill,” and for good reason. Phil Mortillaro uses keys to bring art back to the Village. The former hotel where Tesla invented the radio. The only surviving sidewalk clock in Brooklyn. When Harmony Mill No. 3, was built in 1866, the builders had no idea that during the excavation of the north section of the mill, they would discover the bones of a 13,000-year-old extinct male mastodon. 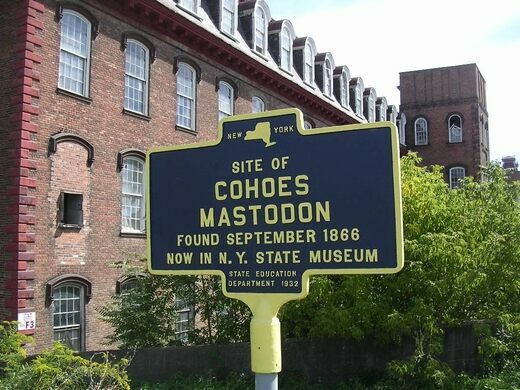 A historic marker was placed on the corner of North Mohawk Street and Front Street, where the skeleton of the Cohoes Mastodon was found embedded 60 feet deep in the bedrock near the base of the Cohoes Falls. 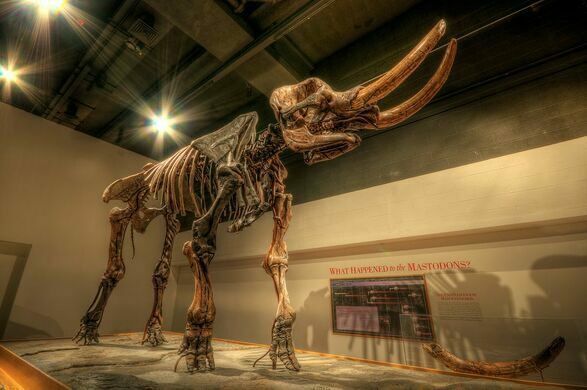 When the mastodon was alive, he weighed around 5 to 6 tons and stood more than 8 feet tall. Archaeologists determined that he died at the age of 32 after a musth battle when his skull was pierced by a rival’s tusk. The bones of this great prehistoric creature did a little bit of traveling before finding their resting place at the New York State Museum, where they remain on display today. They made their way from the Harmony Mill office to the city of Troy, to the county fair, to Harmony Hall, to the State Cabinet of Natural History in Albany, to the State Education building on Washington Avenue, and finally the New York State Museum on Madison Avenue in Albany. 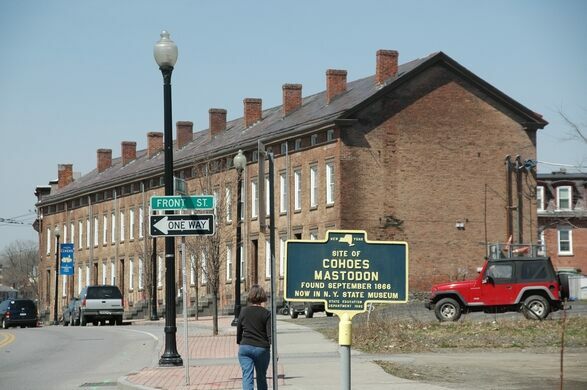 While visiting the site where the mastodon fell, stop over to nearby Falls View Park for a breathtaking view of the Cohoes Falls by walking on the footbridge over the power canals. Manhattan may have name-brand recognition and Brooklyn a certain cache, but Queens is the city’s largest and most diverse borough. Join us, May 17–20, to dig into Queens’ rich neighborhood life. The original Uncle Sam was actually a New York meatpacker who is buried under this historic grave. This historic church with a connection to "Uncle Sam" is now a fraternity house. This relic of 19th-century infrastructure is one of the few remaining coal gas storage tanks in the U.S. The first American home of the isolated, egalitarian religion has a trove of Shaker architecture and artifacts. 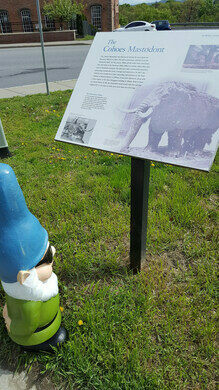 A Bronze Age stone ship said to be the grave of the mythical founder of Gotland. This prehistoric figurine is the oldest known realistic depiction of a human face. A mountain range on an active U.S. Navy base hides thousands of mysterious prehistoric rock carvings. It's possible to walk inside one of the largest Neolithic tombs in Britain.